The discovery of artifacts writings on various historical relics prove that typography has accompanied the development of human civilization and be a liaison between the times . Naturally, if the typography is referred to as a reliable means of communication because it is able to survive for centuries in establishing universal human interaction . The emergence of thousands of fonts and " experimental typography " on various types of media indicate that the function of typography as the expanding literacy has become the object of an experimental and artistic expression . Discretion of the function used to create a typeface that represents local knowledge of Javanese culture that was adapted from the classic batik motifs Garuda Yogyakarta style of the interior . Value mythical eagle valuable and unique artistic value of scratches batik canting an inspiration in the creation of the typeface Garuda Batik . The figure of the eagle that had accompanied the history of the Indonesian nation is at once the spirit of the nation's cultural heritage that should be preserved. Universal nature of typography is the right solution to communicate the values contained in the motif of Garuda in the global arena . 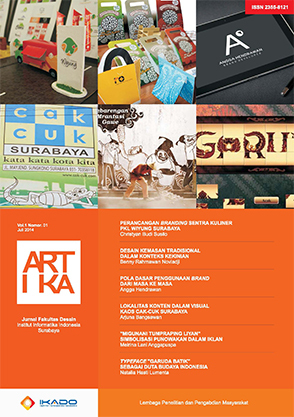 Typeface Garuda Batik able to adapt to the lifestyle of modern society through its applications in various types of media , techniques , and visual styles are up to date . Typeface Batik Garuda is also a tangible manifestation of nationalism human visual communication design to create a national paradigm design work. 1. Berryman, Gregg. (1979), Notes on Graphic Design and Visual Communication, William Kaufmann, Inc. ,California. 2. Craig, James. (1990). Basic Typography A Design Manual, Watson-Guptill Publications, New York. 3. Hutajulu, Rina. (2008) "Lihat, Baca, dan Rasakan" Concept. 4. Kusrianto, Adi. (2007), Pengantar Disain Komunikasi Visual, Penerbit Andi, Yogyakarta,. 6. Rabinowitz, Tova. (2006), Exploring Typography, Thomson/Delmar Learning, USA,. 7. Scheder, George, (1994). Perihal Cetak Mencetak, Penerbit Kanisius, Yogyakarta,. 9. Susanto, Sewan. (1980), Seni Kerajinan Batik Indonesia, Balai Penelitian Batik dan Kerajinan, Yogyakarta. 10. Susanto, Mikke. (2002). Diksi Rupa, Kumpulan Istilah Seni Rupa, Kanisius, Yogyakarta. 11. Sudjiman, Panuti & Aart van Zoest. (1992), Serba-serbi Semiotika, PT Gramedia Pustaka Utama, Jakarta. 12. Unesco. (1965), The Art of Writing, Paris, Druck- und Verlagshaus F. W. Wesel Baden-Baden, Federal Republic of Germany. 13. Widodo, Suryo Tri, dalam Suwarno Wisetrotomo. (2008), Landskap Tradisi, Praksis Kriya, dan Desain, cetakan kedua, BP ISI Yogyakarta, Yogyakarta.